No matter how many teeth you have lost, dental implants in Temple are the premier option for replacement. 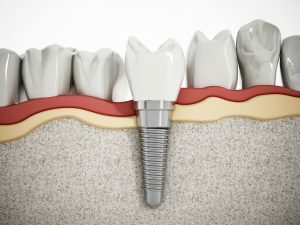 Dental implants are getting more and more popular, but a lot of questions still remain for many patients — like how long does it take to get them? And how much do dental implants cost? We’ve got the answers in this week’s blog post. Stick around for the dental implant FAQ! Q: What is a dental implant? A: A dental implant is a titanium post that takes the place of a missing tooth’s root. It is implanted beneath the gum line, where it promotes bone growth and gradually fuses together with the jaw bone. A connecting abutment attaches the prosthetic tooth or teeth to the implant after healing is complete. A: Dental implants are completed in two phases. Initial implantation is a surgical procedure completed under local or general anesthesia, when the implant is carefully placed beneath the gum line and the gums are stitched shut again. Healing takes place over several months. Once the jaw bone has grown around the dental implant(s), the prosthetic crown, bridge, or denture is placed in the restoration phase. Q: How long does it take to get dental implants? A: You can expect it to take from six months to a year to complete the dental implant procedure. It’s an investment in time, but the benefits of dental implants — including better oral health, clear speech, and others — make them well worth the time spent. Q: Will I need other procedures, too? A: If your teeth have been missing for a while, if your jawbone is weak, or if there is not enough space to place a dental implant, you may need to have a bone augmentation procedure to add volume to the area where it is lacking. Bone graft or sinus lift may add a few months and additional cost to the dental implant treatment. A: While you may need to have the prosthetic teeth replaced at some point due to natural wear and tear, your dental implants should last a lifetime with proper care and maintenance. A: The total cost of your implant procedure will vary based on several factors, including how many teeth you are missing, where they are located, what type of implant you will receive, and whether or not you need a bone graft first. In general, the cost of a single dental implant ranges between $3,000 and $4,500. Q: Am I a candidate for dental implants? A: Many patients who are already missing or are on the verge of losing teeth are eligible for dental implants. You should be in suitable oral and overall health to aid in proper healing following the procedure. Schedule an appointment with your implant dentist to learn more about your candidacy for dental implants. Dr. Richard Fossum and Dr. Brooke Elmore are trusted providers of general dentistry services in Temple, including dental implants. If you have remaining questions about this premiere tooth replacement option or to schedule an appointment with your trusted dentist, do not hesitate to contact Fossum Dental Group at 254-778-3900.